What is that weird symbol next to the monitor behind Jan and Grayson? It's only visible in the wide shots (start of the motorcycle gang segment is a good spot). It looks like the female symbol (venus' mirror) with the male symbol (ares' spear) attached to the upper left and right corners of the circle, except the one on the left has a line going across the shaft. Hi Minerva. Good to see you back again. Thanks for clearing that up. I'd wondered about that myself but had thought it was possibly just something dreamt up by the set designers. U+26A7, if you ever need to use it. I've seen another implementation of the symbol in which the central circle has a diagonal line through it (similar to the "national speed limit applies" road sign, althouth the diagonal line is the other way around). That striking through of the central circle is supposed to make it inclusive of people who do not identify as either male or female. But I cannot reproduce it here because it's not as yet in Unicode. You know what other symbol is odd to include since we're on the O series? The Ø. It's no more "an O with a line through it," than an E is "an F with an extra line." It's a different letter. 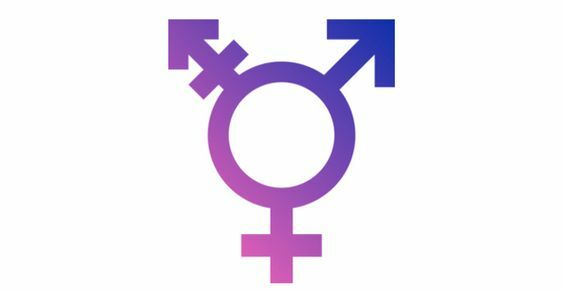 I have no idea how the transgender symbol has any relevance to the theme of the season (it seems to be there in several/all episodes), but I don't mind a bit of queer representation, although it is a small thing. It's sort of a reminder that queer things exist everywhere, though.